After 3 years from the last Full Lenght Album “Anima Noir” (2008), Theatres des Vampires are back with a new Full Lenght. Moonlight Waltz 13 tracks of PURE vampirism.. Romantic lyrics, lyrical voices, strong orchestration, powerfull guitars and powerfull drumming. 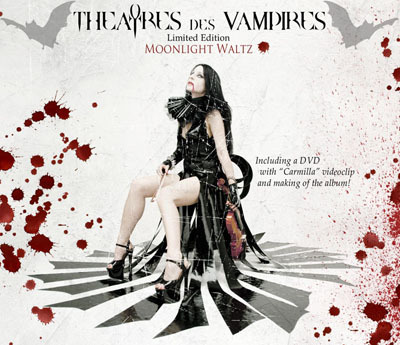 All the elements that you loved in Theatres des Vampires are back in this new production. A new modern sound and a super modern production that took 6 months of work in the studio for recording and mixing it, offering you the best experience of vampirism as always, with the enchanting vocals of the mistress of your nightmare: Countess Sonya Scarlet. Click for buy it - VISIT OUR ONLINE SHOP! Theatres des Vampires are pleased to announce the videoclip "Carmilla" from the album "Moonlight Waltz".